Eight hospitals have been chosen by state authorities to defend on the front lines against the spread of Ebola in New York, four of them within the five boroughs. These hospitals, which include Mount Sinai on the Upper East Side, Columbia University-affiliated New York-Presbyterian, Montefiore in the Bronx, and Bellevue Hospital Center in Midtown Manhattan, will get intensive training first. In the event of a confirmed case, the patient would be transferred to one of the eight hospitals. The state’s other 200 hospitals will also prepare, starting with a three-and-a-half-hour training session for health care workers at Javits Center Oct. 21, where infection control experts will demonstrate how to wear and remove protective equipment. Specialized teams at the MTA and Port Authority will be trained in handling patient risk affecting commuters. Unannounced drills will be conducted to test workers at college campuses, subway stations, and other transit areas. In the coming days the MTA will outline an Ebola virus protocol to riders through its messaging system. The Port Authority is also tasked with coordinating between all state airports to ensure the proper training is in place. Two ambulances are to stand by around the clock at all airports to transport potential patients with Ebola. “This is very much a group effort and a coordinated effort,” Cuomo said Thursday at an event streamed live from his office website. According to the most recent data available from the Centers for Disease Control (CDC) dated Oct. 6, approximately 88 New York patients have been the subject of inquiries from New York City authorities. Forty-nine had not been in affected areas in the previous 21 days, 28 people met travel criteria but not clinical criteria. Of the 11 who had been in affected areas, one was tested for Ebola and found to be negative. Eight were diagnosed with malaria, one had typhoid fever, and two others had no clear diagnosis. 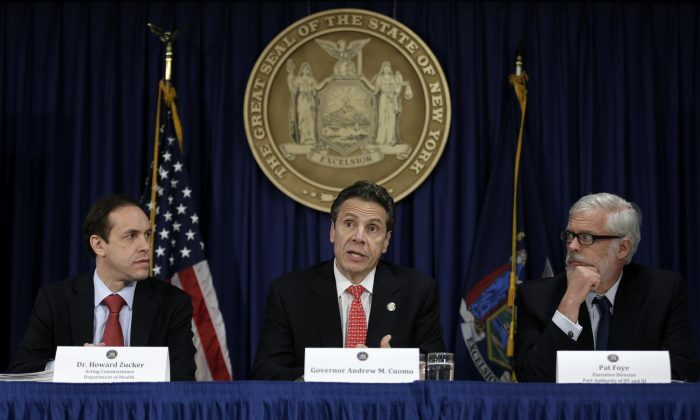 “No New Yorker should be unduly concerned if we identify an Ebola case in New York,” said Cuomo. The de Blasio administration has designated Bellevue Hospital Center the primary hospital in the city to handle Ebola cases. In a statement Wednesday the hospital said that it would receive any confirmed patients from within its system of 11 public hospitals. It is also preparing to receive transfers from other New York City hospitals, if needed, in consultation with the city’s Department of Health. It would also receive cases from NYC airports. Bellevue has prepared four single-bed rooms in its infectious disease ward to receive high-probability or confirmed Ebola cases. It also has a new onsite laboratory to handle possible Ebola blood samples. The hospital has a long history of being on the front lines of epidemics and emerging public health threats, and managing an isolation unit for diseases, according to the statement. Leaders from the designated hospitals listed their particular expertise and expressed their support for the governor’s plan as part of the statement sent out by the governor’s office. “New Yorkers will be well-served by having specialty centers located in their communities with the expertise to respond quickly and efficiently if the need arises, said Montefiore Health System president and CEO Steven M. Safyer, MD.